We are a dedicated team of five professionals and our aim is to provide the highest level of expertise of plumbing and heating within our field. The business was established in 1997 however, Sean has been in the industry for 25 years. Our dedicated, family focused team plays a vital role in the running of the business. In addition to Sean – his wife Mairead deals with all the necessary administration. The business also employs three highly skilled and competent engineers. They are all well trained and are the key to a safe and efficient workplace. The business is based in Carryduff in South Belfast and specialises in work on both new build and existing properties, carrying out both new installations and regular servicing. As a business, we work hard to provide our customers with an excellent service and as a relatively small team we are driven to go the extra mile to please them. We are customer care driven. Our commitment is to ensure that our service delivery is totally “customer focused” and we pride ourselves on our outstanding customer service. Our customers are at the heart of everything we do therefore it is essential that they are satisfied with our workmanship. We understand it is a fundamental requirement of our business that we provide a good service from the outset - from pricing up the job, to advising our customers of all the benefits available to them. We understand that if we provide a great service for a reasonable price, our customers will recommend us and this has been a key reason for the growth of the business over the years. Our aim is to treat every customer with integrity and provide a reliable service that they can truly depend on and trust. We continue to make significant investment in training by keeping our employees up-to-date with all the latest courses available to them which in turn improves their knowledge and skills by both the theory and hands on practical experience that pays huge dividends in their day-to-day work for the business. 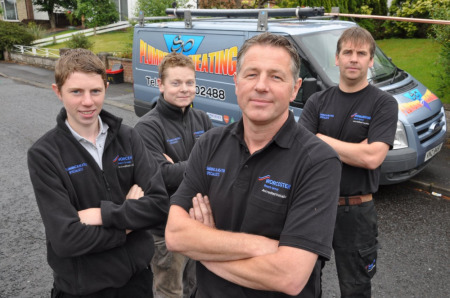 "That SP Plumbing & Heating Specialists has continued to grow in stature and reputation over the last 10 years. Not only does the company demonstrate considerable determination and hard work, their approach to providing high levels of customer service and their support of Phoenix Natural Gas initiatives has led to the company being a leading installation company in the domestic sector". Despite the gloomy economic forecast across the UK and in the Plumbing and Heating sector, SP Plumbing & Heating Specialists remain optimistic. Over the last 2 years the company committed to a business plan that would allow us to survive the economic downturn and enable us to strive and build on our achievements to date. In a year that businesses have been shedding staff we have managed to significantly increase our turnover, creating new job opportunities in the process and welcoming a full-time apprentice to our work force – excellent progress by any standards. After a successful 2011, our main objective is to continue to achieve accolades from our customers for the highest standard of work we can give to every completed job and to maintain our customers’ high levels of satisfaction with our services. Through a continued dedication to technical skills training and a commitment to managerial development we aim to establish SP Plumbing & Heating Specialists as a leader in our field.